A dragon turned Princess Ann into three fairies. A young knight sets off to save the kingdom and the princess from Boralis. 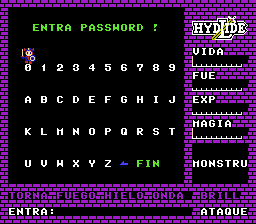 It is up to Jim to find the three fairies and defeat Boralis to rescue Ann. 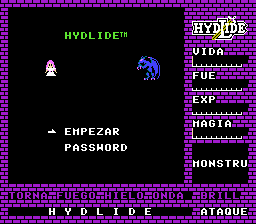 The gameplay of Hydide is repetitive, boring, and mindboggling. This is because the main fighting mechanic is having Jim walk directly into the enemies in order to battle them. 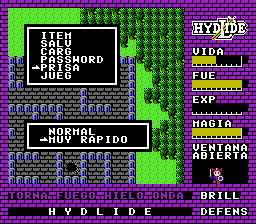 Due to this mechanic, every battle can ultimately result in a quick death because there is little to no strategy when it comes to fighting. 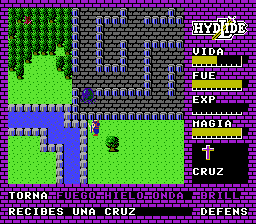 The end result is many frustrating deaths to the same strong enemies over and over again. 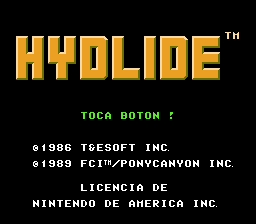 Translation to Spanish for “Hydlide” for the NES.